Once upon a time, a great King and Prince decided to they didn’t want to be alone anymore. There were other beings in their realm, but none like them. No one else to share their love and unity with, at least not in the way they longed for. So they came up with a plan. They created a beautiful garden and from the earth they molded living, breathing people patterned after their own image. They wanted these people to be their companions, but not as servants or slaves, and that meant the people had to be given free will. They would need the opportunity to choose the King and Prince just as the King and Prince chose to want them. But there was an evil force at work. One of the other beings, prideful and jealous of the King, led a revolt and became the Adversary. And as Adversary, he made it his goal to thwart the King’s plan, including the great plan to grow his family. The Adversary was not powerful enough to destroy the King. But he knew if he could kill these new people who the King wanted to become his children he would have his revenge. When tempted by the Adversary, the King’s new creation fell into his lie. They chose a path that led away from the king their Father and the Prince their brother. And that choice changed the battle field between the King and Prince and the Adversary. Now they fought over the fate of the King’s children. The King and Prince weren’t caught off-guard by the Adversary, though. They already had a plan, but it seemed a strange sort of plan for going into battle. Rather than using force to get the King’s children back they used love. The Prince came as a suitor asking for his adopted sister’s hand in marriage. And some of the people made a covenant with him, but there was still a death penalty hanging over their heads. The Adversary had talked them all into breaking the King’s law and someone had to pay the price justice demanded. So that’s what the Prince did, leaving his kingdom and making himself vulnerable on the battlefield. The Adversary threw everything he had against the Prince, but he didn’t win. The Prince conquered the Adversary personally and then gave his own life to pay the penalty hanging over his beloved’s head. In doing so he sealed the ultimate victory. The Adversary keeps fighting though, trying to destroy as many people as he can before his time is up. But even though the Adversary is still doing damage in the world, the King is holding off on the final battle. He wants to get as many people as possible on his side because he knows if they don’t accept the victory he and the Prince already won that they’ll take part in the Adversary’s defeat. And his goal all along was to make every single person part of His family. He’s not giving up on reaching as many of them as he can. So he keeps calling people to join in following the Prince as the Adversary keeps trying to yank them away. That is the situation we’re called into today when we begin a walk as Christians. Our Prince, brother, and rescuing lover Jesus has achieved victory. But His people here on earth are still fighting the Adversary Satan, waiting for the final battle to end all this. We’re called to be part of God’s family. Along with that comes an invitation to a battle. Satan wants us dead whether we’re following God or not (John 10:10). But when we actively commit to God, then the Adversary hates us even more. But there’s also more hope for us, because the One who cannot be defeated promises to fight for us and alongside us. 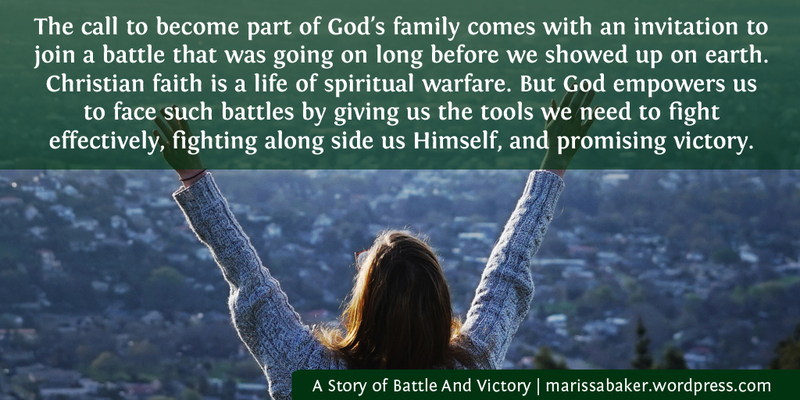 And he gives us armor to wear, which is what I’ve been blogging about the past two months (today’s post is the last in our spiritual warfare series). 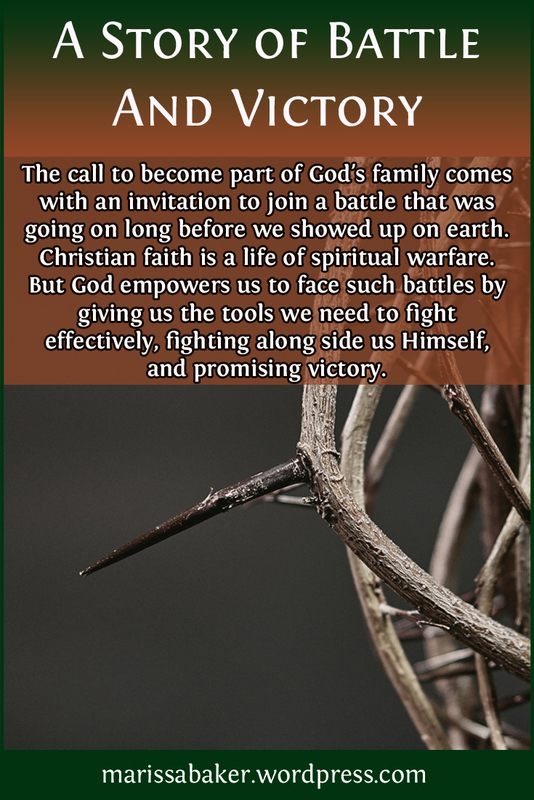 We talk about spiritual warfare fairly often. But I’m not sure how real it seems to us that we’re in a daily battle against spiritual forces of wickedness. Even when we don’t feel like we’re fighting through trials from the outside we might be facing more subtle forces that are trying to lure us away from faith. Spiritual warfare doesn’t have to be big and showy, either in attacks or defenses. I like the way this author talks about our Christian fight. Achieving victory isn’t always about some big, noticeable battle. Sometimes, perhaps even more often, it’s about less-showy or “little” things. It’s doing what’s right in spite of your fear, or helping someone when you’d rather do something else, or making a choice in faith and then acting on it instead of getting stuck in thinking or planning. In his letters to Timothy, Paul makes it a point to talk about the fact that our lives as Christians are lives of warfare. We’ve already quoted the passage from 2 Timothy where Paul calls him a “good soldier of Christ Jesus” (2 Tim. 2:3, WEB). Going back to the first letter, Paul says one of his purposes in writing was to help Timothy fight well. Like Timothy, we are soldiers fighting in a spiritual battle. For all of us, “We must through much tribulation enter into the kingdom of God” (Acts 14:22, KJV). That word translated “tribulation” literally means pressing together (G2347, Thayer’s). We’re not going to get through life as followers of Jesus without encountering pressure, resistance, and distress. But we know that if God is for us nothing can stand against us (Rom. 8:31-38). And God isn’t just “for us” in some vague sense of being on our side. He’s also clothing us with His armor and fighting beside us. So long as we don’t give up and reject His leading, He will bring us to victory and give us eternal life.